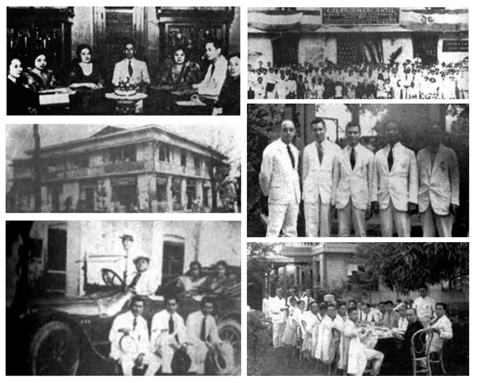 In a luncheon tendered by Dr. Mariano V. de los Santos, then President of the University of Manila, at his home in Balintawak, it was decided by the attendees composed of then college and university presidents, at the suggestion of Justice Jose Abad Santos and Conrado Benitez, that an association of private universities be formed to set higher standards for private educational institutions and to promote the interests of private education in the country. 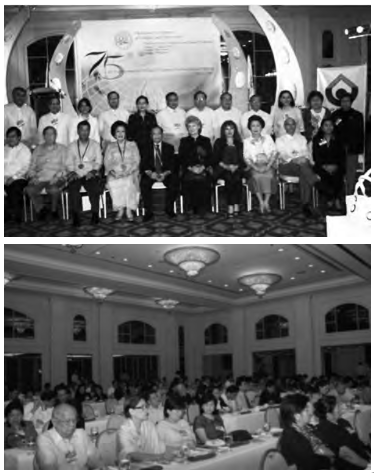 From there the Association of Filipino Private Universities and Colleges (AFPUC) was born. Among the leaders in attendance were Senator Camilo Osias of National University, Dr. Nicanor Reyes, Sr. of Far Eastern University, Jorge Bocobo of the University of the Philippines, Francisca Tirona- Benitez of Philippine Women’s University, Tomas Mapua of Mapua Institute of Technology, and Don Vicente Fabella of Jose Rizal College then. AFPUC was formally organized with Camilo Osias elected as president. Mrs. Francisca Benitez headed an AFPUC delegation that petitioned to President Manuel L. Quezon to dispense with taxes from schools that did not pay dividends. The same represenation was made to then Speaker of the House of Representatives, Hon. Jose Yulo, with the House Ways and Means Committee. The campaign resulted in the passage and enactment of the law to this effect and Speaker Yulo himself informed Mrs. Benitez of its passage. Former AFPUC President Nicanor Reyes, Sr. was appointed member of the National Council of Education. Former AFPUC President Camilo Osias was appointed Acting Director of the Office of Private Education. AFPUC opposed the 1% tax on gross income of private schools. AFPUC changed its name to “Philippine Association of Colleges and Universities”, as motioned by Chancellor Laurel, and voted unanimously in a meeting at the National Teachers College. PACU held its First National Educational Conference. The Second National Educational Conference was held at the Arellano Hall, Far Eastern University. PACU continued to lodge their opposition to the One Percent Assessment Act and formed a committee composed of President Manuel V. Gallego, Vicente G. Sinco, Benjamin Salvosa, Leoncio B. Monzon, and Perfecto Laguio to contest RA 74. PACU lobbied for the ammendment of RA 74 and abolition of the one percent assessment tax. Justice Domingo Imperial was awarded the PACU Public Service Award. PACU disputed a memorandum of the Bureau of Private Schools (BPS) that limited the admission to teacher-training and other professional courses to high school graduates who belonged to the upper half of their class. Secretary of Justice Oscar Castelo then ruled the memorandum to be illegal. 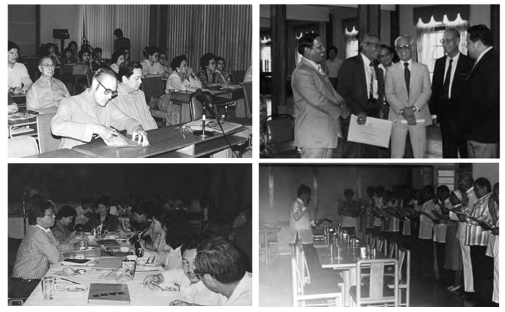 Dr. Mariano de los Santos forged an agreement with then Committee on Free Asia (now known as Asia Foundation) to implement the Student Activity Program (SAP) with student interests being foremost in PACU’s agenda. A special committee on SAP was composed of Chancellor Manuel Gallego as chair, Dean Edgardo L. Paras and Dr. Helena Benitez as members, and a secretariat headed by Prof. Amado C. Dizon, PACU Executive Officer. PACU was requested by the Secretary of Education to conduct a survey and evaluate the Philippine educational system. PACU instead suggested to create a government commission to which it would extend assistance in its endeavors. To protect the names of reputable private schools, PACU demanded for a published list of diploma mills. For the benefit of students and schools, PACU also called for the publication of bar and board examinations. 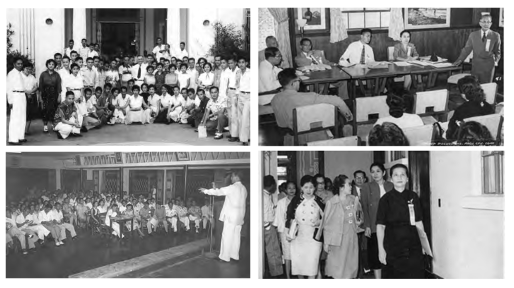 PACU actively participated in the 1957 Educational Conference with President Mariano V. de los Santos as conference chairman. In that conference Rep. Carmen D. Consing, then chair of the House Committee on Education, supported PACU’s stand and promised to work for the repeal of RA 74. In a meeting on September 14, PWU Vice-President Helena Benitez suggested to create the PACU Cooperative Graduate School. With the approval of BPS of the PACU M.A.T. program which was a consortium among PACU graduate schools, the aim to help students of member schools was realized. PACU also protested the encroachment by the different examining boards in the making of curricula. PACU fought to repeal RA 1881 (Spanish Law) to reduce the required 24 units of Spanish courses and advocated that 12 units be compulsory while 12 other units be optional. 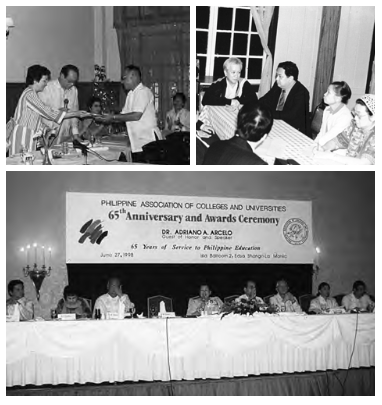 In collaboration with two other groups, the Catholic Educational Association of the Philippines (CEAP) and Association of Christian Schools, Colleges and Universities (ACSCU), PACU founded the Coordinating Council of Private Educational Associations (COCOPEA) as the umbrella organization of all private educational organizations in the Philippines. Later, two other groups joined forces with COCOPEA, namely, the Philippine Association of Private Schools, Colleges and Universities (PAPSCU) and the Association of Philippine Private Technology-based Institutions (APPTI). PACU President Pablo L. Meer sat as the first chair of COCOPEA. PACU objected to the Aldana circular that exempted the graduates of government teacher-training institutions from annual teacher-selection examinations, which PACU deemed discriminatory to graduates of private teacher-training schools. President Fernando Bautista advocated that regional offices of the BPS be authorized to issue special orders to expedite the release of transportation and other expenses to effect savings on the part of private schools. PACU schools adopted a self-imposed limitation of 12% on return on investments. PACU also cooperated with Dean Daniel M. Salcedo on a self-improvement project designed to improve instruction and end the disenfranchisement of high school graduates who wished to pursue higher education. A meeting of student council presidents sponsored by the PACU Special Committee on Student Affairs was held to study and promote worthwhile student affairs. A model set of rules and criteria was issued to PACU member schools for such administrative details as faculty classification,salary scales and fringe benefits. Dr. Virgilio de los Santos proposed that the degree of Doctor of Jurisprudence be awarded to graduates of a four-year-course in law. PACU participated in the first revision of the Manual of Regulations of the Bureau of Private Schools orginally drafted back in the 1940s. In the midst of developing its existing resources, PACU executive officer Dr. Amado C. Dizon, sent out questionnaires to get constructive feedback on its accreditation program. On behalf of its members, PACU entered into an agreement with the Asia Foundation for book donations. PACU co-signed a trust agreement with the Department of Education and the Development Bank of the Philippines for the administration of the War Damage Fund appropriated for private education. In a joint effort with CEAP and ACSCU, the creation of the Fund for Assistance to Private Education (FAPE) was made possible which extends financial assistance to private educational associations and their members to promote the welfare of private education. With the help of both Philippine and United States governments and the Private Education Assistance Committee (PEAC), FAPE was formally launched on November 5. FAPE has since become a symbol of the government’s regard for private education as an integral part of Philippine life. There was unprecedented increase in PACU membership through the efforts of President Virgilio de los Santos even in the face of increasing violent student demonstrations in Manila for which PACU sought the assistance of Mayor Antonio Villegas in ensuring the safety of the academic community. PACU’s active role in the passage of legislation and introduction of amendments to existing laws was helped by tapping some of the more brilliant minds in the academe such as Dr. Amado Dizon.When Congress enacted The Tuition Fee Law, RA 6139, which specified that student fees may be increased by not more than 15% per annum, member-schools of PACU conducted an intensive lobbying campaign against its passage. PACU succeeded in implementing accreditation for its members milestone and noteworthy achievement given the turbulent times and the darkest moments of Philippine education following the imposition of Martial law in 1972. President Ferdinand Marcos amended RA 6139 with PD 451 whereby 60 percent of any increase in tuition fees must be used to increase the salary of school employees, and 40 percent for institutional development. The Department of Education upheld PACU on the individual institution’s right to give its own entrance exams in addition to the National Collegiate Entrance Examination. Other notable PACU activities included its participation in the revision of the elementary curriculum and the study it conducted on the retirement systems for school personnel. PACU succeeded in amending Sec. 6 of Rule II of MECS Order No. 19 (which would have disqualified members of the school’s governing board from being appointed or designated to administrative positions). PACU participated in the New Delhi UNESCO-Paris Draft Convention on Recognition of Studies, Diplomas and Degrees. PACU took part in the MECS-sponsored Conference on Educational Development and the lifting of Martial Law. It also held a Conference on Financial Strategies in Times of Scarcity. The toppling of the Marcos Regime by People Power Revolution in 1986 paved the way for social and political reforms such as the reconsideration by the Supreme Court on the consolidated cases on tuition fee, declaring, among others, that Sec. 3 of PD 451 had been repealed by Sec. 42 of BP 232 in the 1987 Constitution. RA 6728 was enacted by Congress which provided assistance to students and teachers in private schools and required consultation on any tuition fee increase. Violent student protests persisted and PACU suspended classes for four days due to the government’s inability to protect them. Congress enacted Joint Resolution No. 2, which mandated the review and assessment of the entire educational system, and from this the Congressional Commission on Education (EDCOM) was created. With PACU’s extensive experience and expertise in governance and management, private financing of education, and human resources development, the association played a significant role in EDCOM’s final recommendations for the overhaul in all levels of education in the public and private sectors. When Congress passed RA 7079 providing for the development of campus journalism, PACU issued a model set of guidelines for the implementation of this law in private schools. In consultation with the Department of Labor and Employment (DOLE) , PACU conducted a study on retirement systems for private school employees. PACU also made representations with Congress for the enactment of RA 7641 which provided for retirement to qualified private sector personnel in the absence of any retirement plan in the establishment. The second revision of the Manual of Regulations for Private Schools under then Education Secretary Armand V. Fabella was also a high point in PACU’s history. To date the revised manual has been regarded as “The” guidebook of all private shcool operations. Congress passed RA 7731 which PACU had been lobbying for, abolishing the NCEE. PACU had early on argued that the NCEE disenfranchised students of their basic right to education. With the enactment by Congress of RA 7877 declaring sexual harassment unlawful, PACU issued to member schools a model set of rules and regulations to implement the law on campuses. PACU initiated work for the joint promulgation by DOLE, DECS, CHED and TESDA of labor standards unique to private schools. Together with other members of COCOPEA, PACU suspended classes for one day in protest over the approval of the second reading of the proposed Magna Carta of Students in the House of Representatives. PACU also verbalized its strong stance on other policy concerns of private schools. To this effect, PACU drafted a bill titled, “An Act to Enhance Excellence in Private Educational Institutions, to Provide for their Financing and Taxation, and for other Purposes. PACU enshrined a no-consultation-on-freshmen-tuition provision in the Commission on Higher Education’s (CHED) guidelines. It was carried over to the CHED order the following year. When CHED issued new policies and standards on the grant of university status and the General Education Curriculum, PACU in consultation with other members of COCOPEA, convinced CHED to dispense with the retroactive provision on the former. Likewise, they also pushed for an alternative to the General Education Curriculum. During the 65th anniversary celebration of PACU on June 27 at the Edsa Shangri-la Hotel, its “founding fathers” were honored with a commemorative plaque awarded to the family representatives of the late Jose Abad Santos, Conrado Benitez, Vicente Fabella, Tomas Mapua, Camilo Osias, Nicanor Reyes, Sr., and Mariano de los Santos. With the entry of the new millenium, PACU idenified its goals for the future, acknowledging the growing impact of technology on education, recognizing its need to re-focus on human resource aspect of private education, and re-assessing its voluntary accreditation program. PACU also continued to address recurring issues they have had to grapple with since its inception. Issues such as affordability of private education; amount of government assistance to teachers and students; new faculty career models; and evolving concept of academic freedom. PACU successfully held a seminar-series called “E3” or “Emerging Education Executives” management seminar. The PACU Board launched the nationwide “Voter Education Program” to educate student voters on the value of voting and voting responsibly to prepare them for the 2004 elections in May. To enable more public information access, PACU reactivated its website with links to sites of its member-schools. In October, when House Bill No. 2536 was introduced, PACU vigorously opposed its passage. In effect, the bill sought to amend Article 281 of the Labor Code whereby the probationary period of employment of academic personnel in private schools were being cut short. PACU’s stance was the bill violated freedom of schools to determine on academic grounds who may teach, what may be taught and who may be admitted to study. PACU filed a petition in court to declare CMO No. 14 null and void. CMO No. 14 was created to regulate increases of various school fees for School Year 2006-2007. PACU raised explicit concerns on certain house bills such as one that placed a cap on tuition and other fee increases as well as proposed amendments to Sec. 42 of BP 232. On the house bills proposing amendments to RA 7722 (the CHED Law), PACU and COCOPEA made known their position that the bills should provide measures to eliminate discrimination between public and private higher education institutions, and minimize political interference in the exercise of CHED powers. PACU with COCOPEA engaged in a dialogue with the Commissioners of the Professional Regulation Commission (PRC), tackling concerns on the manner with which the PRC published results of licensure examinations. COCOPEA’s recommendation was accepted by the PRC which resulted in the promulgation of Resolution No. 2006-375, series of 2006. PACU and COCOPEA reached an agreement with President Gloria Macapagal-Arroyo on the creation of a body that would review the policy-making structure of CHED to align it with its true mandate of developmental supervision of all higher educational institutions in the country. In response to PACU’s concerns on accreditation, the Philippine Association of Colleges and Universities – Commission on Accreditation drew up a revised accreditation instrument incorporating an out comes- based factor. PACU’s 75th Anniversary celebration took off with the unveiling of its new Vision and Mission Statements crafted after a series of regional workshops. PACU forged agreements with different industry and government institutions to enhance and expand the scope of its corporate and social responsibility. PACU became an associate member of the Association of Universities in Asia and the Pacific (AUAP). PACU joined the other COCOPEA member associations in a two-day strategic planning workshop for academic years 2009-2011 at the Ateneo de Manila Univesity. With PACU as lead association, COCOPEA held a symposium on the “Global Economic Meltdown: Its Impact on Private Education in the Philippines” at St. Paul University – Manila. PACU launched its Academic Management Seminar Series at Far Eastern University. With the World Wide Web in a whole different place than it was a decade ago, PACU set in motion an interactive website. PACU made representation with the Department of Education (DepEd) to review the 2010 “Revised Manual of Regulations for Private Schools in Basic Education”, claiming that a number of the amendments which found their way in the new Manual ran counter with existing laws and jurisprudence. PACU conducted regional summits on the proposed K to 12 basic education program. PACU, together with the other members of COCOPEA, initiated dialogue-to-action sessions with DepEd, CHED, Technical Education and Skills Development Authority (TESDA), and PRC. Plagued by congressional initiatives on prohibition against the “No Permit, No Exam” policy and consultation on miscellaneous fees , a contingency of PACU and COCOPEA officers conferred with, and submitted unified position papers, on the two issues to the members of education committees of the Senate and House of Representatives and the CHED, respectively. This year marked the 80th Anniversary of PACU led by President Peter Laurel. A national conference on “The Challenges of Internationalization” highlighted the event. PACU participated in the revisions of the Manual of Regulations for Private Schools that amended the Revised Manual of Regulations for Private Schools in Basic Education and in drafting the Revised Manual of Regulations for Private Higher Education Institutions. Dr. Patricia Bustos-Lagunda of Baliuag University was inducted as the new president of PACU. This year also marks the participation of PACU in several dialogues with various stakeholders regarding issues and policies on K-12. PACU witnessed the signing in Malacañan Palace of the historic RA No. 10533 entitled, “Enhanced Basic Education Reform Law,” or the K-12 Law. PACU assumed the chairmanship of COCOPEA under PACU President, Dr. Patricia Bustos-Lagunda. PACU was a member of various technical working groups that dealt with the K-12 Curriculum, the new General Education curriculum, revised Program Standards and Guidelines, Philippine Qualifications Framework following the ASEAN Qualifications Reference Framework, CHED Multi- Sectoral Committee on Tuition and Other School Fees and in consultation meetings with these agencies. COCOPEA, led by PACU, participated in drafting the guidelines for the implementation of the labor component of the K-12 Implementing Rules and Regulations under DOLE’s Education Industry Tripartite Council to balance the interests of management and labor. PACU was a member of the Public-Private Partnership Steering Committee to mitigate losses and stimulate provisions of SHS for the private HEIs during the transition period of the K-12 Program. A memorandum of agreement for the development of a research project on the “Role and Contribution of Philippine Private Higher Education” was signed by PACU and the De La Salle University – Lasallian Institute for Development and Educational Research (DLSU-LIDER). Funded by PEAC-FAPE, the research was turned over to PACU during its 82nd Anniversary. Dr. Karen Feliciano-De Leon, president of Misamis University, was inducted as the new president of PACU and continued the chairmanship of COCOPEA. PACU commissioned a marketing survey on voucher top-ups with the objective of giving the Department of Education an estimate of the number of public school students who will transfer to the private sector. PACU together with other COCOPEA representatives met with Commissioner Siegfried B. Mison of the Bureau of Immigration to discuss the concerns of its international students regarding the issuance of visas to foreign students. On May 19, 2015, Commissioner Mison issued Immigration Memorandum Circular No. SBM-2015-007, which seeks to streamline the issuance of a student visa to a foreigner wishing to study in the Philippines. PACU, together with the Fund for Assistance to Private Education and the Asian Development Bank, and the other members of COCOPEA, contributed their views to the Public-Private Partnership in Education and helped shape the Comprehensive and Unified Financial Assistance System for Tertiary Education (UNIFAST) managed by CHED. PACU participated in several forums of the Philippine Business for Education and the National Competitiveness Council , and have taken part in technical working groups on curricula and program standards and guidelines, Philippine Qualifications Framework based on the ASEAN Qualifications Reference Framework, CHEd Multi-Sectoral Committee on Tuition and Other School Fees, and other numerous consultation meetings of governmental agencies. This year heralds the first year of implementation of Grades 11 and 12 which also coincides with the assumption of Dhanna Bautista-Rodas of the University of Baguio as PACU president. PACU with other COCOPEA member associations participated in conversations with the Philippine Association of State Universities and Colleges (PASUC) to address issues on providing quality education to the marginalized sector, sustainability of private and public higher education, and the leveling of the playing field through differentiated markets, quality assurance, and governance. Under the chairmanship of the committee on policy, Dr. Vicente Fabella together with other PACU Board Members lobbied with legislators and lawmakers regarding the concerns of private HEIs, especially on the bill or “Act Promoting Universal Access to Quality Tertiary Education by Providing for Free Tuition and other School Fees in State Universities and Colleges, Local Universities and Colleges and State-Run Technical-Vocational Institutions, Strengthening the Unified Student Financial Assistance System for Tertiary Education, and Appropriating Funds Therefor.” The bill provides universal access to tertiary education by providing for a tuition subsidy and financial assistance to students enrolled in the SUCs, LUCs, private HEIs and TVIs. In the same bill, PACU together with COCOPEA requested the inclusion of COCOPEA chair as a voting member of the UniFAST Board.